I know I am old and out of touch, because I think I am the last person on the planet to discover the wonderfulness of podcasts. I have listened to podcasts on my computer for a long time, but it wasn’t until I started running that I ever thought of downloading them to my phone. And I have discovered that I really LOVE running to podcasts. It seems to make the time pass more quickly, even more quickly than music does. I get engrossed in the story and don’t even notice the mileage slipping by. So I am on the hunt for awesome podcasts. I have been listening to lots of NPR podcasts, TwoFitChicks, Roni Noone, and Bloggirlspod (well, they’ve only had one so far, but it was fun!). Do you have any that you love that you could recommend? I am grateful for podcasts. Oops, it’s midnight…barely made it in for a gratitude photo today! This afternoon, after a really happy trip to the mall with Mack, I decided to take a really long walk. I didn’t get to take my yoga class today, because my gym was closed for “employee appreciation day” and today was a day off for running. So I decided to go on a 5 mile walk. I thought that wouldn’t be a big deal. I walk several miles every day. I run several miles three times a week. So I took off on a route I had mapped out earlier. Once I got to the half way turn-around point, I thought, “What have I done?” My legs were TIRED. But I stuck it out (what choice did I have) and walked back towards home. 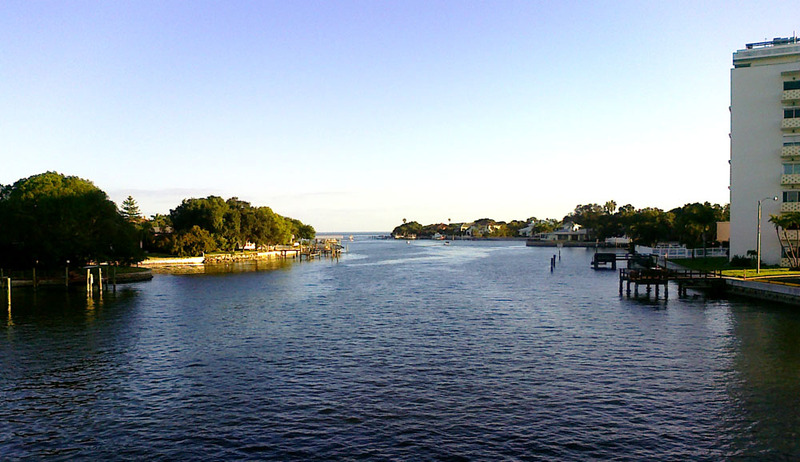 I was rewarded on my way back with beautiful views of Tampa Bay and Placido Bayou. I am grateful for a view of the bay on my walk. Maybe this will just become a food blog, since I’ve been posting so many dinners lately. But I have been wanting to start cooking again for a while and I’m having so much fun doing it. Especially trying new things with our CSA veggies. The only thing we have left is the cucumbers (because I already had a couple of cukes when we got our farm share) and the turnip greens. Using three bunches of greens in one week is just not possible. Luckily we are only getting a share every other week so I can use them this week. Tonight I made a recipe out of Clean Eating Magazine, which I only recently discovered. Love this magazine! I made sloppy joe’s with ground turkey (instead of the bison 😯 that the recipe called for), eggplant, yellow squash (instead of zucchini) and other veggies and spices. The boys LOVED them. 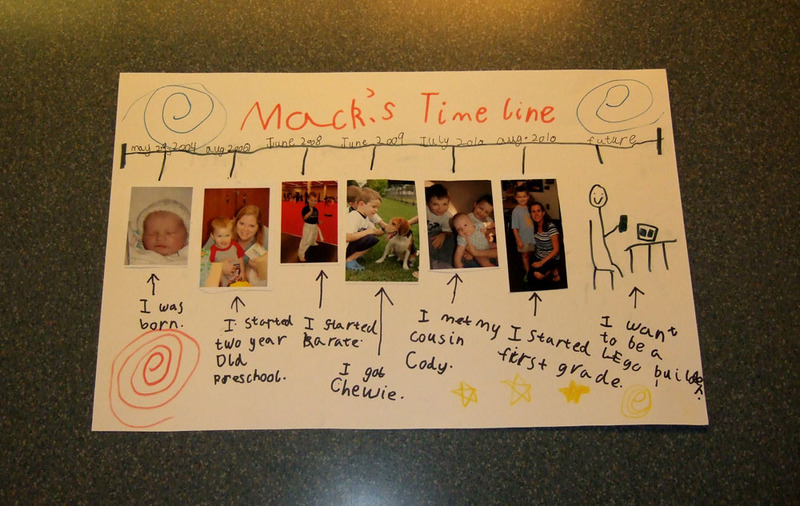 I also made fries out of delicata squash ala Roni Noone (Greenlitebites), which Mack loved and Cal tolerated. He said they reminded him of my sweet potato fries which he also didn’t love. I’m pretty sure I’m going to subscribe to this magazine. So many good ideas in there. 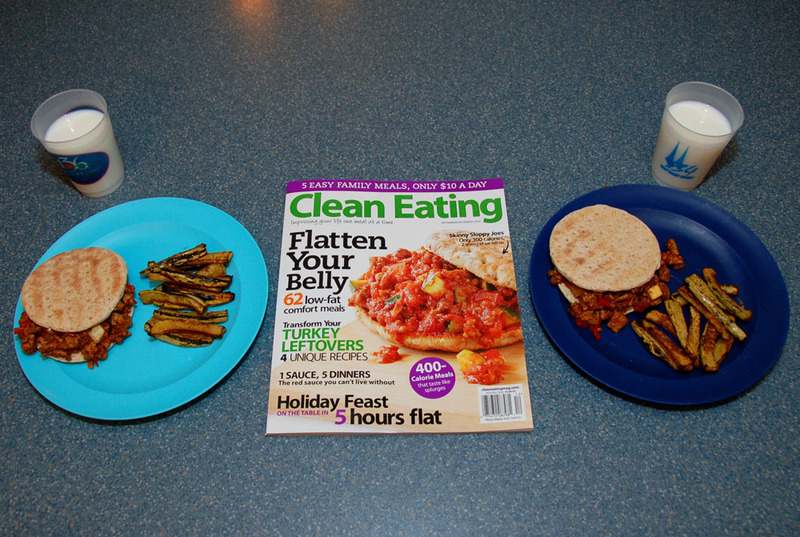 I am grateful for Clean Eating magazine. The boys’ school is having this thing this week where the kids commit to not watching television from Monday to Friday. If enough kids keep their commitment the principal is going to do something whacky next week. I don’t think our kids watch too much TV (20 hours a week is not too much is it? ), but both boys wanted to do the commitment so I agreed. It’s been kind of rough. More interaction between the boys means more arguing. Mostly about who gets to use the computer, since they have basically just substituted computer games for television. 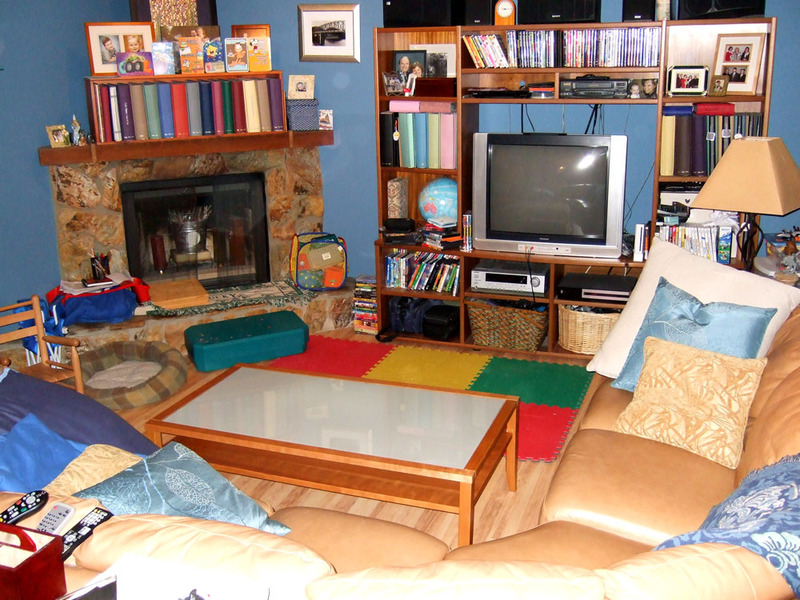 But they have also played some games together, and I instituted the master plan…use TV watching time to clean up the hovel! It was totally out of hand. This may not look like the neatest, cleanest room to you, but imagine it with every horizontal surface (including the floor) completely covered with toys. That’s what it looked like at the beginning of the week. The boys really pitched in and we picked up all the toys from the great room and cleaned up their room. It is soooo much better. Now maybe I can begin to think about the holidays. I am grateful for No TV Week. 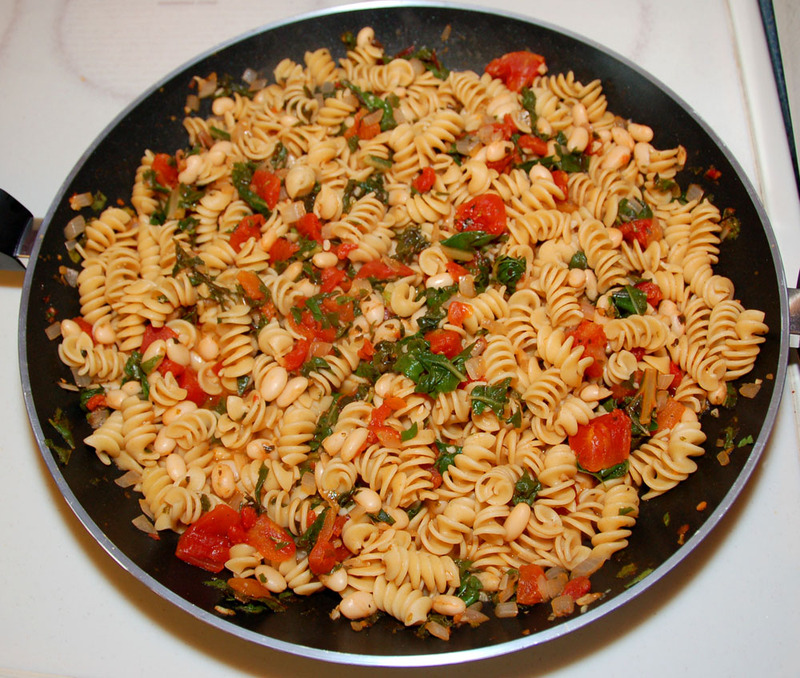 This is pasta with swiss chard and beans. I used one of Roni Noone’s recipes on GreenLiteBites. You can check it out here. It made me happy for several reasons. First, it used up the chard from our CSA share. It’s kind of challenging to use mustard greens, turnip greens and swiss chard all within a week or so. Second, the boys loved it. They kept “yumming” and raving and said I HAVE to make it again. Score! Third, it’s super healthy. Vegetarian, high in protein, low in fat. Awesome. I am grateful for my yummy healthy dinner. This dog is sound asleep and snoring in this picture. This is his usual sleeping position. I took three flash photos with my phone, which makes a loud “photo snapping” fake noise when taking pictures, and he didn’t budge. Sorry it’s a little immodest! 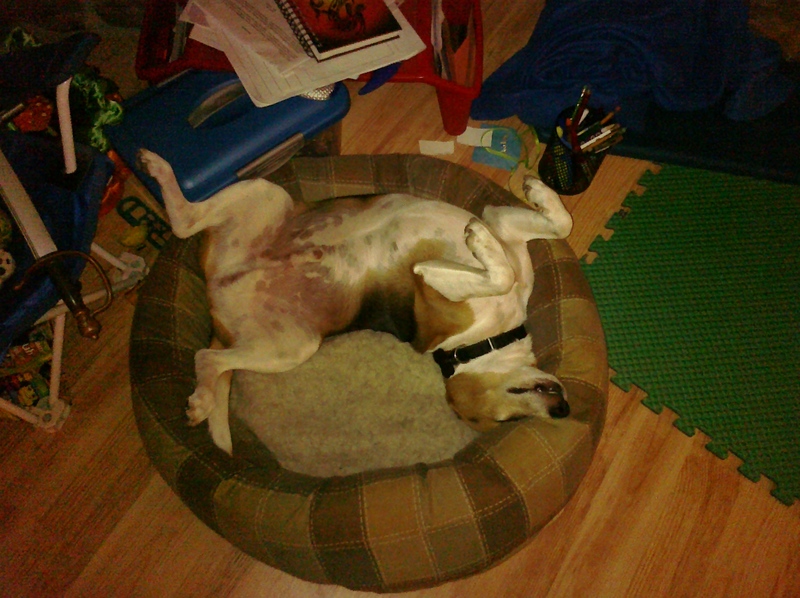 I love this silly beagle. I am grateful for my crazy dog.